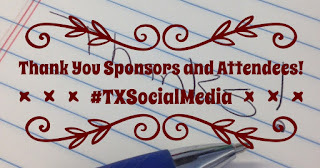 The 5th Annual Texas Social Media Conference is officially over, but the tweets, social media ideas, and engagement with our conference sponsors will continue to live on! This conference attracted over 120 community members, faculty, staff, business leaders, and students from four states! We were fortunate to have recurring sponsors and new sponsors! These sponsors include: Hail Merry, Go Go Squeez, Sprouts Farmers Market, Generation Texas, Blue Diamond Growers, Fuzzy's Taco Shop, Divine Elements of Design, Pepsi, Nothing Bundt Cakes, Brewed Coffee and Pub in Fort Worth, Go Picnic, @FiestaWinery, and Dannon Yogurt. 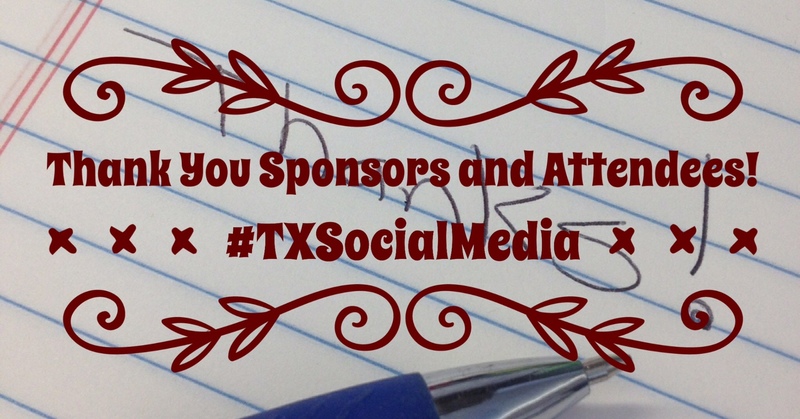 Texas Social Media Conference - Welcome Announcement, Housekeeping, and Overview of the Day! This conference welcome announcement was simultaneously sent via Periscope to the Five Networking Rooms (Teaching and Learning, Social Media Research, Social Media Marketing, Innovation Rooms 1 & 2). The Texas Social Media Awards ceremony was broadcast to conference attendees and organizations across the state. *In addition, we highlighted one of our school district winners at the beginning of the chat lunch - Granbury ISD. The innovation theme was also present during social media reception (instead of a traditional reception). We hosted a photography contest! This reception-based photography contest challenged attendees to think "outside of the box" and to engage with one of the conference sponsors (@NothingBundt). Also, this contest enabled conference attendees to network, participate in a contest, and to develop ideas for their individual (and organization-based accounts). During the next few months, we will post the slides from this year’s presentations as well! We would officially like to thank all of the conference attendees and we look forward to reading your tweets, answering your questions, and engaging with you on our various social media accounts! We would like to say THANK YOU to the following institutions, companies, school districts, and entrepreneurs for attending!